Who is on top in the Nike vs. Adidas battle? January 15, 2018, 12:25 p.m.
YouGov brand tracking data in the UK underlines how close the incessant battle between Adidas and Nike is. Among all respondents, Adidas currently has a very narrow lead over Nike in terms of its Impression score (whether someone has a positive/negative impression of the brand). 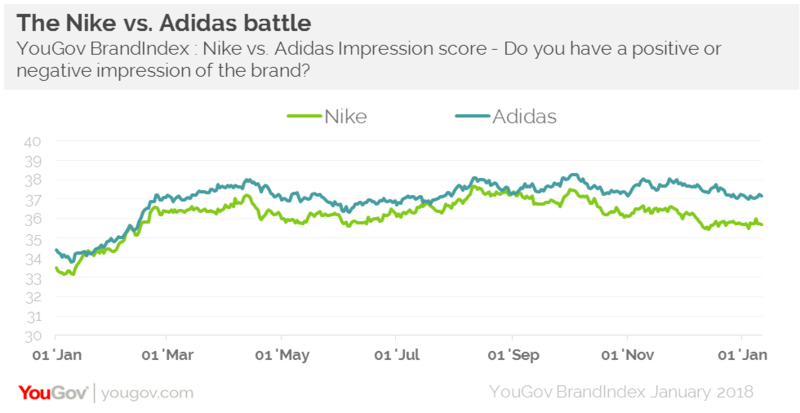 Both rate very highly on this metric, with Adidas currently sitting on +37, and Nike on +36. These scores have remained relatively stable over the past 12 months. Looking specifically at those aged 18-34, Adidas and Nike are currently neck and neck at the +40 point mark. However there is a difference when it comes to gender. While men are more inclined to have a positive impression of Adidas (+37 vs. +31), the story is reversed among women, though the gap is closer (Adidas is on +38, Nike +40). Looking at the brands’ respective campaigns, throughout the year both have had fairly high Ad Awareness scores (whether someone has seen an advert for the brand in the last two weeks), though Nike outstripped Adidas at all times, peaking in August with a score of +19, against Adidas’ high of +10 in October. With so little between the brands, choice may be dependent on an individual’s perception of the specific product’s quality or value. Of course, these can vary across the brands’ diverse product range, but generally speaking, Adidas is seen as being kinder on the purse strings. Its Value for Money score is currently at +12, against Nike’s +6. Indeed, the German manufacturer is seen as proving the best value for money out of any of the sports brand that YouGov tracks. However, when it comes to quality, Nike comes out best, not just topping Adidas (+39 vs. +36), but the sports clothing sector as a whole. In the US, Nike has a clearer advantage over its rival in terms of Impression score among all respondents. Nike is currently on +47, ahead of its German rival on +41. In both cases, the scores have risen by a couple of points since this time last year. Among 18-34s the scores are higher, but Nike (+56) still has the advantage over Adidas (+51).